So there I was, one fine day, when my office called to ask if I could follow up on a piece of business involving one of the residence halls at University of San Francisco. No problem, I replied, mentioning that, as a USF grad, I knew the place well. Little did I realize how few similarities there were between the Hilltop of the 1970s and today’s campus. First, there was parking—oh, parking—how that has changed for the worse! The “streetcar college” that my father and uncle attended in the 1930s has long since expanded into an international university. My Volkswagen and I (followed by a Chevy Nova after the VW’s inevitable 1973 demise in an accident) used to visit there daily, and parking was always tough, but this time, zipping down Golden Gate Avenue behind the library, there were absolutely NO open spaces—worse than what I used to encounter on those foggy mornings in the ’70s. I was thinking of using the underground lot near the Gym—a favored illegal spot from the past, since it was well known that tow trucks could not reach the lowest levels. To my amazement, smaller yellow tow trucks (they’re called “low-boom”) were hauling off a trio of cars as I drove by. Finally nosing into a spot on one of the Terraces, those short streets that run between Turk and Golden Gate, I discovered that a construction project blocked access to the campus. Entering the back of the Harney Science Building, I meandered through a series of linoleum-floored and flickering-fluorescent corridors (where words like “Fortran” and “cobol” plus IBM punch cards used to be cutting edge) until I emerged near the library. The old asphalt roads and green lawns were gone, replaced by brown stone pavers and a concrete jungle of expanded buildings. The original 1930s-era Campion Hall has been merged with the 1969 concrete block Nursing Building, via a futuristic glass wall. Renamed Kalmanovitz Hall—a veritable mish-mash of architectural styles painted beige—it sits in stark contrast to the baroque glory of nearby St. Ignatius Church. In my mind’s eye, I could still see the ghosts of the past—Professor Lester Greene for Accounting, Father John McGloin for San Francisco and California History, Dr. John Gleason for English Literature, Dr. Katherine Bishop for Education—as real as life itself, all still meandering the campus on their way to class. I had expected to walk past the grassy spot in front of the Harney Science Center where classmates Alan and Ruth “held court” with a group of our friends each lunchtime beginning in 1970. Today, the old lawn and plaza are walled off by a construction fence, hiding a new wing for the science building, as discrete electronic speakers sounded forth a Bach Brandenburg Concerto. Someone later told me that this was an attempt on the part of the school to “disguise” construction noise—nice try, but it doesn’t work. Once in the University Center, the sizzling hamburger-and-fries smell was gone from the area once occupied by the Green and Gold Room—affectionately known as the “G&G” forty years ago—the place where I learned of Spiro Agnew’s resignation. Now there are international aromas of pot stickers, tacos, pizza, chow mein, and piroshkis. The thundering reverberations of Creedence Clearwater Revival have given way to soft electronic music, and that same little 1960s-era elevator around the corner still moved ever-so-slowly. Upon my arrival on the fifth floor, I was greeted with the strong scent of coffee from a central station—not unlike a walk past the Hills Brothers building on the Embarcadero years ago. The area, once a rabbit warren of tiny offices for the school’s teaching staff, now has an open airy feeling, outfitted with cubicles. All those old Smith-Corona portable typewriters belonging to students and the IBM Selectrics of secretaries—clickity-clacking from down the halls and around numerous corners in my memory—have been replaced by quiet keystrokes on hundreds of near-silent laptops and iPads, and phones hum or vibrate but no longer ring. 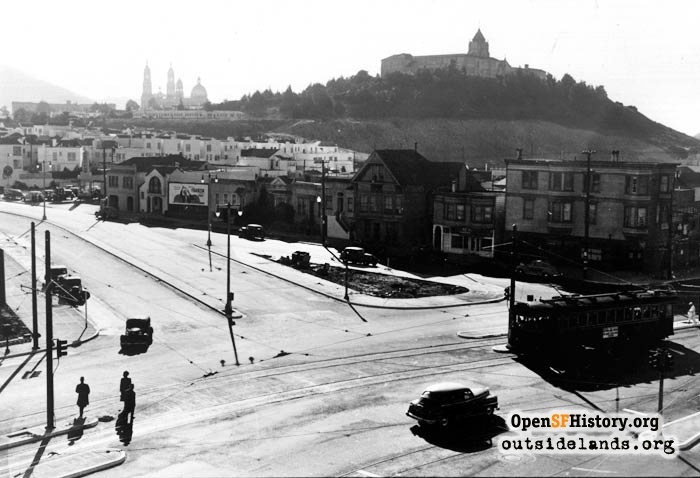 View southwest over the intersection of Geary Street and Masonic Avenue, 1940s. 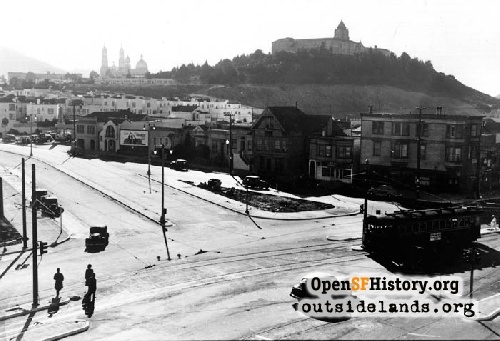 St. Ignatius Church and Lone Mountain campus behind., circa 1940 - Courtesy of a private collector. A pleasant young student, dressed in colorful Pakistani silk robes, and with multiple facial piercings, asked me in perfectly unaccented English how she could help. Clearly, she was not wardrobe-shopping at the Gap, as all of my classmates did. The person who came out to assist me quickly finished up the business at hand, and then offered to give me a tour of the campus to see what else had changed. Across Parker Avenue, the building I knew intimately as St. Ignatius High School in the 1960s, then as “Loyola Hall” in the 1970s, was demolished in 1986 and replaced by today’s Koret Health and Recreation Center. The old 1947 S.I. gym where Dennis Carter died during a December, 1963 basketball game, still stands, alongside the field where hundreds of rallies were held from 1929-1969. The northeastern tip of the field and its baseball batting cage, a gift from the Class of 1924 is long gone, replaced by a multi-level underground parking structure. The Gleeson Library, a plain shoebox-like block from 1950, with an interior similar to the Parkside Library, underwent an expansion/renovation twenty years ago, obliterating much of the plaza in front, while substituting a small oval of grass. Just like some other projects, this one also tacked a stark, angular addition onto the original building—rather like a child combining plain wooden blocks with a 1960s Kenner Girder & Panel Building Set. I could still envision my favorite study corner from finals in the spring of 1972, on the top floor corner, beneath a row of windows. Though books remain part of today’s college experience, electronic data now dominate, and the iconic smells of library paste and paper dust have vanished, along with those tiny drawers of the card catalog, into the foggy mists of the past. Xavier Hall, a 1959 structure of six stories facing Parker Avenue, once home to the large Jesuit faculty, has been transformed into an all-female dorm known as Fromm Hall. The priests still teaching at USF, a literal handful, now live in a small building on the nearby Lone Mountain campus, which was acquired by USF in 1978. USF itself became fully co-educational in 1964, after having accepted women into the Evening College since the 1930s and partnering with St. Mary’s Hospital to offer Bachelor’s Degrees in Nursing since 1951. •	No candles or open flame. Indoor Athletic Activities: The playing of athletic games is prohibited within the residence halls and independent living areas because of the potential for personal injury and damage to the facilities. Prohibited activities include but are not limited to rollerblading/skating, bicycle riding, elevator surfing, tag, Frisbee, football, basketball, hockey, golf, baseball, etc. My tour guide also mentioned that during her own undergraduate days ten years earlier, USF entered into an agreement with Kaiser Hospital to lease a five-story building at the northeast corner of 6th Avenue and Anza Street that was once a nurse’s dormitory at the old French Hospital. Today, known as Arrupe Hall, it offers traditional housing to students of all ages—a USF dorm located one full mile west of the main campus—great trivia question for those who think they know the city! Near the end of the visit my guide pointed out the corner of Turk and Masonic that is now home to the School of Education and the Presentation Theater, both located in the 1930 building that was once Presentation High School, acquired by USF in 1991. The School of Management occupies the old wooden Presentation Convent, now known simply as 281 Masonic, along with a 2004 space called Malloy Hall—a rebuilt wing of Phelan Hall. The War Memorial Gymnasium, remains similar to its original 1958 appearance, but has been renovated to accommodate the expansion of women’s sports resulting from enactment of Title IX regulations. Returning to the University Center, I thanked my tour guide and began walking back to my car, but was drawn to the iconic image of St. Ignatius Church. Strolling across one of the few remaining grassy fields where Welch Hall, the residence for the Jesuits of St. Ignatius High School stood until 1969, I noted the greatly expanded Law School across Fulton Street. The MUNI bus—called the #5 McAllister when it used to whisk me downtown to my afterschool job at Bank of America, but now called the #5 Fulton—still glides smoothly between downtown and the ocean. New letters above the church’s main entrance announce ST. IGNATIUS CHURCH—as if anyone in San Francisco needed to be told that in the last 100 years since the cornerstone was laid in March 1912. Entering from Fulton Street, and walking up that long middle aisle, I thought of my own high school graduation in June of 1970, my cousin John’s five years earlier, my father and uncle’s back in 1932, along with poignant memories of weddings and funerals of friends and classmates. Strangely, the once musty smell that evoked images of “Grandma’s house, circa 1925” was gone. Instead, the sensation was like walking into a Holiday Inn—a bland nothingness. The red carpeting was newer but similar to the old, though the original floorboards beneath and at the edges of the main aisle seemed to have been replaced with something newer, lighter in color, and smoother. As I left, I looked up at the Fulton/Parker corner of the building, taking note of the non-matching color of several bricks near the base of each tower—a slight scar from seismic retrofitting in the 1970s. This was a much maligned project at the time because of its appearance, but by all accounts, it saved the building from serious damage in the 1989 earthquake. Walking back to my car, the breeze blew in from the Golden Gate, and I gazed over the landscape and the horizon that is still viewed daily by thousands of students. It dawned on me that I am now old enough and many of them young enough that we could be grandfather/grandchildren! I quickly realized my good fortune in having been up there at the time that I was, with the friends and experiences that I had, and how those times shaped my life, and continue to trigger such vivid, happy memories, even today. Page launched 31 August 2012.